For the little Irish town of Ballinacroagh, the repertoire of gastronomic delights has never extended farther than the limp meals of the local inn's carvery. But things are about to change when the beautiful Aminpour sisters - Marjan, Bahar and Layla - arrive, determined to share the magic of their kitchen with the friendly locals. Opening Babylon Cafe right in the heart of town, they begin serving up traditional Persian dishes and, soon enough, the townsfolk follow the tantalising aroma of fresh herb Kuku, lamp abgusht and elephant ear fritters, washed down with gallons of jasmine tea from the old samovar. A heart-warming and hilarious tale of romance, friendship and exotic food, filled to the brim with recipes, mouth-watering fragrances and mysterious spices. Just arrived in snowy Minnesota and this book literally looks good enough to eat with wonderful recipes. Can't wait to start. Thanks Laura0141 for setting this up. I just finished the book a few minutes ago and absolutely loved it. It started off a bit slow, but quickly picked up and was reminiscent of Chocolat, as the story revolves around cooking and a cafe set up in a small town by 3 out-of-towners. I especially was interested in the parts that took place in Iran and wished it had gone more in depth; also the relations between the townspeople and the 3 foreign women were interesting. The book was lovely and I'm going to copy the recipes and give a couple of them a try! On to randomelement as soon as I get her address! Sent out today to randomelement. Enjoy!! The book has arrived safely. Thank you for sharing it. I will get to it very soon. tara49307 did not answer PM's. Mailing to loveamystery today. This was a great book and a wonderful story. Happy reading! It's here! Looking forward to this one. Thanks for sending it, randomelement. This was a very good story and easy to read. I hope she writes a sequel. Thank you Laura0141 for sharing it. This book is now on its way to voveryte. Enjoy! After such a long journey the book is finally here! Looking forward to reading it soon! Thanks loveamystery! Very enjoyable! I like cooking a lot and this book inspired me for new experiences. I didn't like the ending much though, I felt like I've missed something. The book got here safely today. The book is on its way to hetku77. 30.10. The book arrived today, thank you boirina! Even the outlook of the book is so tempting, that it makes me want to start reading it right away :). 26.11. I finished the book over the weekend and I really loved it. It was really interesting and heart-warming story about three sisters and how they lives have been evolved. The mouth-watering recipes in between were really tempting and I liked how Persian cooking was involved with the story. A bit more depth view in the in the parts that took place in Iran would been interesting, but it might have brought more sadness in the story. yesterdaysgirl asked to be skipped and I've asked Cross-patch for her address. 28.11. I mailed the book to Cross-patch this morning. It's here. Thankyou laura0141 for making it available and hetku77 for getting it here. Finished during the Christmas break and although I was slow getting into it I grew to really enjoy it. The slow unwrapping of the sisters' unhappy final times in Iran was the success in the Soup. Very comforting. Arrived this morning a lovely surprise. Will finish the book I am reading and get on to this. I'm not really sure how to described this story. Needless to say I enjoyed it ad despite it's often tragic story at times I found the recipes intersperced through it comforting. Away to PM the next participant. Haven't managed to get in touch with the next participant so away to contact the next person in the list. 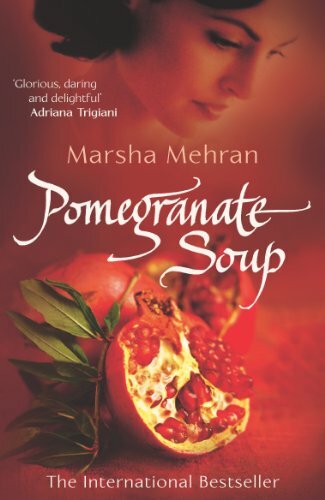 This attractive book arrived just as I decided the pomegranate had gone off and only managed to salvage half the seeds. It's a charming book, would stand alone very well but felt rather derivative of Chocolat both in set up and plot developments, however that didn't actually matter because of the interest between Ireland (I felt a little lightly portrayed) and Iran (I'd read a couple about the revolution which coloured my reading). The lamb abgusht is very delicious (and as medicinal as chicken soup, actually!) with chelow rice, as is the pomegranate soup (with a new pomegranate, not syrup), and the lentil soup. As soon as I've copied the recipes, it'll be on the way to paganfrog if her cage rattles. Marsha Meyran could well write a sequel to this ... I'm sure there's at least another book in there and more of those wonderful recipes would be a treat! PS There's also a Penguin cookbook of Persian recipes called 'The Legendary Cuisine of Persia' by Margaret Shaida - and in London you can get the goods in the three Persian shops on Ken High Street nearer to Olympia. Patisseries to OBESE for! this book arrived 2 days ago, i got sidetracked and forgot to post here. i will je it as soon as i have read it.